(London) When 36 year old Asylum seeker Munir Mohammed met 33 year old Rowaida El-Hassan on singlemuslim.com, a Muslim dating site, they hit off with a bang. So much so, that when El-Hassan found out that Mohammed was preparing to wage Jihad against the kufur in the UK, she used her position as a pharmacist to provide chemical expertise in which to murder as many innocent people as possible. 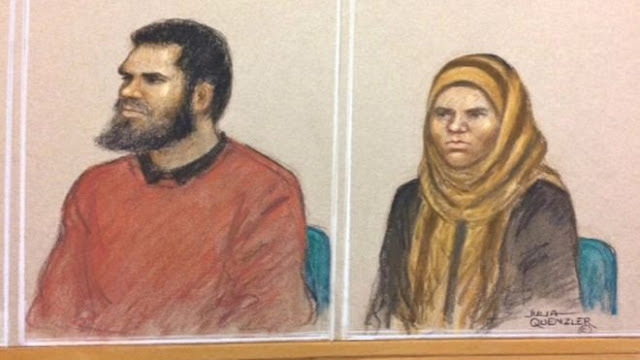 When the pair were arrested in December 2016, Mohammed allegedly had two of the three components for explosives and instruction manuals on how to prepare explosives, mobile phone detonators and nerve agent ricin, El-Hassan assisted Mohammed by providing him with information about chemical components required for bomb-making and how to source them and she assisted his online research about the manufacture of ricin. Mohammed, 36, of Derby, and El-Hassan, 33, of North-west London, are accused of preparing terrorist acts between November 2015 and December 2016. Both deny the charge.